If you have never had to hire a lawyer, you may think that bringing a potential case to an attorney will always result in you having representation. In reality, this is not the case at all. While there are certain cases that will are obviously in dire need of legal aid, there are others that simply will not be taken on by a firm because it’s not a smart move. While many people will get extremely upset should a lawyer refuse to take their case, there are good reasons why an attorney will pass. This is especially true of cases that involved personal injury claims. Below you can get a better understanding of why a lawyer wouldn’t want to take your personal injury case. When you first seek counsel, the lawyer is going to know one very important thing: what happened? If you want to hold someone accountable for a car accident, you have to prove that they have breached their legal duty of driving responsibly. Plain and simple, it has to be obvious that the other party is at fault. If it appears to the attorney you are meeting with that you are at least 51 percent at fault for the accident occurring, chances are, he/she will not take the case. All in all, the lawyer you are trying to hire has to consider what the likelihood of success is in the case before they ever agree to represent you. Lawyers talk to people all the time who don’t have a leg to stand on when it comes to the case they want to take to court. If you come into a lawyer’s office claiming that you could have been killed and yet you don’t have so much as a scratch on you, this is a red flag to the attorney that you are just looking for an easy way to make some money. 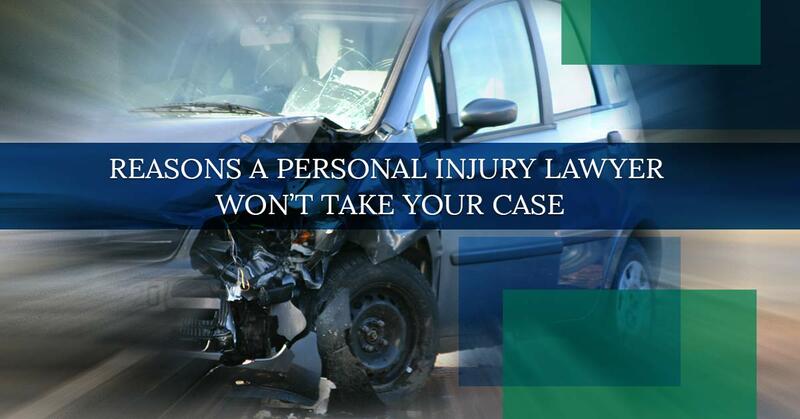 Personal injury cases rely solely on the extent of which you were hurt. If you cannot prove that your body or your life was impacted at all by the accident to your lawyer, how do you think you can prove it to a judge? That’s right, you won’t be able to. An attorney can recognize relatively quickly if a person’s claim is legitimate or if they are simply trying to pull the wool over the legal system’s eyes. Many times, clients will enter the office of a lawyer with an idea of how much money they should receive from their claim. This is almost always an indication that this client has already spoken with one or more lawyer who has given them unrealistic expectations. Additionally, if a client has been dropped by another law firm, it is unlikely another firm will take them on as they are likely to be a liability. Lawyer are offered multiple cases a day. This means they have to decide which cases are worth their time and effort and which one are not. While the clients that get passed up may not appreciate this, an attorney only has so much time in their days just like the rest of us. They have to figure out which cases they can put time and effort into while getting the best possible outcome for both the client and their firm. If you have been injured in an accident and are unsure of whether or not you have enough of a case to press charges, consult the expert attorneys at Alex Hernandez Trial Law. We can give you some idea of whether or not you should press charges against the other driver or not. Schedule an appointment to speak with one of our talented lawyer today!